With over 80% of women using a wireless device and 17% now using a smartphone such as an iPhone, BlackBerry or models from HTC, Samsung, LG or similar, the mobile phone may increasingly be displacing the PC for women, especially in the 12-24 age group according to our recent Women and Digital Life study, which is based on in-depth interviews with 2,000 women aged 12 and older in the U.S. Among women with access to Internet and a mobile phone, teens and young women under 25 spend twice as much time (2.8 hours per day) on average with their cell phones compared to women 40+ (1.2 hours). In contrast, young women spend 2.9 hours per day with their PCs, significantly less than the 40+ average of 3.5 hours. Younger women are also much more likely to use the full functionality of their wireless devices than older women. For example, 12-24s are twice as likely to have sent a text message in the past month compared to women 40+ (85% vs. 43%). Over half (53%) of women under 25 used the calendar on their wireless device to book an appointment or review their schedule vs. 22% of women 40+. Greater mobile usage and smartphone ownership is allowing women to bypass the PC to upload their pictures to social media sites. Nearly three-quarters (74%) of 12-24 year-olds indicate taking a photo with their cell phone in the past month. Young women are twice as likely to say they used the Internet browser on their cell phone in the past month. Likewise, they are about 4 times as likely to access social media such as a Facebook profile or MySpace page on their mobile phone – in the last month, 22% of 12-24s used their mobile device to access Facebook, MySpace or Twitter. When asked “what technology had the most impact on your life in the last 2 years,” women overall picked the Internet, followed by PC/Computer, and cell/wireless in a distant third spot. 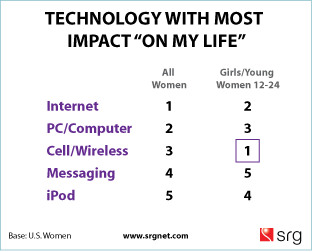 Among young women, however, wireless devices took the #1 spot. Smartphone ownership is growing—17% of women with a wireless device have one. 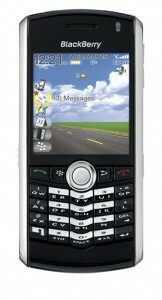 Among those 12-24, ownership is now 23%, aided by the popularity of the iPhone and cheaper access to consumer models such as the BlackBerry Pearl. Another indication of the important role of mobile phones in women’s lives is multitasking with the cell phone. Seven-in-ten young women are watching TV with a wireless device, as they text, browse or play games. Half (49%) of young women say do this frequently, in contrast, just 24% of women 40+. Technical: this post is a part of a series of releases from the Women & Digital Life study which is based on over 2,000 in-depth interviews and explores how women navigate in the age of broadband, mobile and social media. This release contains information from the Wireless chapter of the study. Women & Digital Life is an independent syndicated study conducted by SRG (Solutions Research Group). The fieldwork for this study was completed in December 2008 among a representative sample of 2,000 online American women consumers 12+. The sample captures all major population segments, e.g., parents with preschool kids, tweens or teens, young women, and empty nesters. Sample design included an oversample of African-American and English-speaking Hispanic women. Where applicable, the results are compared to a similar study undertaken by SRG in 2007 among 1,508 women, plus focus groups conducted over a 2-year period. For more on the reports, click here or keep up with Women & Digital Life on Twitter.